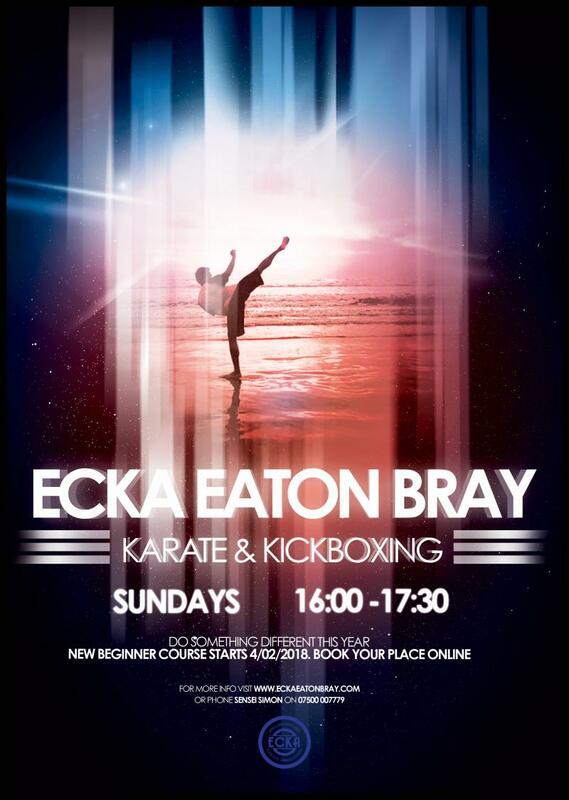 Archives of Eaton Bray News for January 2018. There's plenty ahead to brighten your spirits after the winter gloom - daffodils, ducklings, daylight and the divine Danesborough Chorus, which will perform its next concert on Saturday 3 March 2018, 7.30 pm, at St Mary's Church, Woburn. 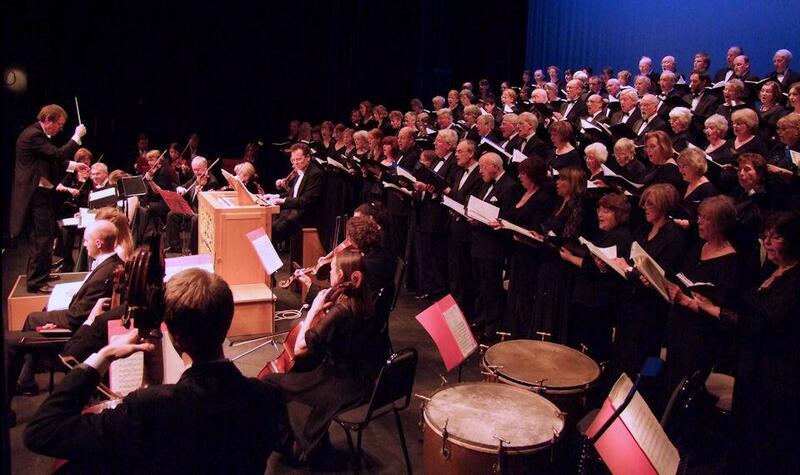 This concert will feature four contrasting choral gems composed by Rheinberger, Sullivan (of Gilbert and Sullivan fame), Britten and Tippett, taking the audience on a musical journey from the Victorian era to mid 20th century . There's 'two for the price of one', when the Danesborough divides into two unaccompanied choirs to perform Rheinberger's flowing, melodic Mass in E flat, first published in 1878. Sullivan's dignified Te Deum Laudamus is a thanksgiving anthem written in 1900 to mark the coming end of the Boer War, though it wasn't performed until 1902. Britten's Rejoice in the Lamb, one of his most popular choral compositions, has almost local connections, having been commissioned in 1943 for the 50th anniversary of St Matthew's Church in Northampton. Tippett's inspired oratorio A Child of our Time, composed during the Second World War, uses five American spirituals and is reminiscent of Bach's use of chorales in his Passions. "It will be a perfect evening for those who relish the emotional power of voices singing beautifully in harmony," says the choir's Music Director, Ian Smith, who will conduct the concert, with organ accompaniment by John Witchell. Could any music-lover ask for more? Tickets for this concert : £20 and £15 (reserved); £10 (unreserved, side aisle); £5 (for under 18-year-olds). Book by phoning 01908 583460, or visit www.danesborough.org.uk for booking form. Consultation on the local plan began at 10am on Thursday 11th January 2018 for a period of six weeks until 5pm on Thursday 22nd February 2018. In accordance with Regulation 19 of The Town and Country Planning (Local Planning) (England) Act 2012, CBC is publishing its Pre-submission Local Plan and are inviting you to express your views by taking part in the consultation. All of the documents are available to view from 10am on Thursday 11th January on-line and at the Council Offices in Chicksands (opening times from 8:30 to 17:00 Mon -Thurs and 8:30 - 16:00 on Friday). In addition, the Local Plan will be available to view at the Customer Service Centres in Biggleswade and Leighton Buzzard, and the main libraries across Central Bedfordshire (opening times vary). It is important you have your say now because only the comments (representations) submitted during this consultation will go forward to the independent Planning Inspector to review before the Public Examination on the Local Plan. In addition, only those who have made a comment can speak at the Public Examination sessions. Within the parish there is a lack of available land for burials, the current land will be full/unavailable within a few years. 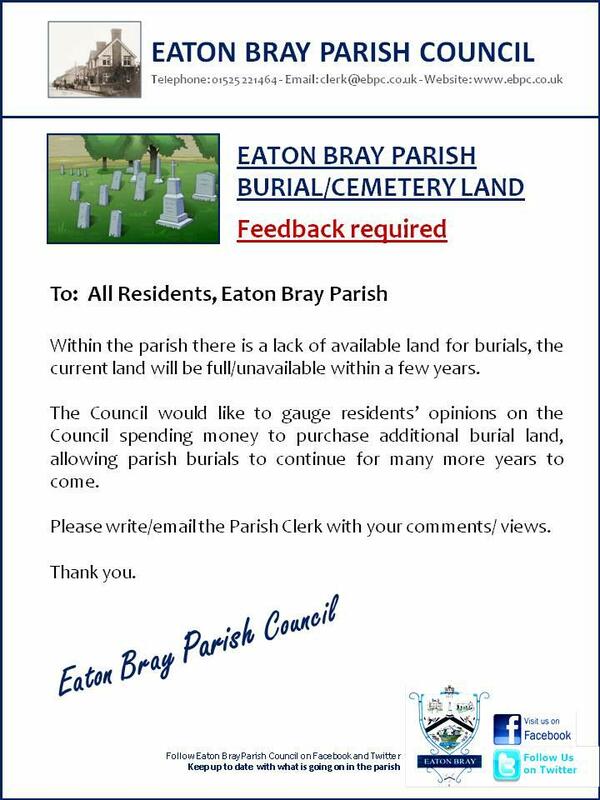 The Council would like to guage residents' opinions on the Council spending money to purchase additional burial land, allowing parish burials to continue for many more years to come. Please write/email the Parish Clerk with your comments/views. The next Parish Council meeting to be held at the Coffee Tavern on Monday 8th January 2018 at 7.30pm. The full Minutes for 4th December 2017 are also now available. You are viewing the January 2018 archive.